U.S.-based Filipino grandmaster, GM Julio Catalino “Ino” Sadorra, won the recently concluded Manhattan Open 2016. The 15th Annual Manhattan Open was a 5-round chess tournament held from July 29-31, at the Hotel Pennsylvania, 401 Seventh Ave. (32nd-33rd St, across from Penn Station), New York, NY. The event had 6 sections: Open, Under 2200, Under 1900, Under 1600, Under 1300 and Under 1000, and the playing format was 5-round Swiss with time control 40/100, SD/30, d10. The top 10 finishers of the Open section are listed below. Check out the rest of the standings here. GM Tamaz Gelashvili was last year’s winner. You might also want to read: Sadorra unfazed by big challenge in Olympiad. Ene pinsan catalino ini par Abel Dimalanta? Ehe! We can not blame promising Chess Players like GM Wesley So and GM Julio Sadorra in taking residence in the US because they want to improve themselves further to become world class Grandmasters. It is there where they can participate in world class chess tournaments and meet world class GMs and improve on their ELO ratings. 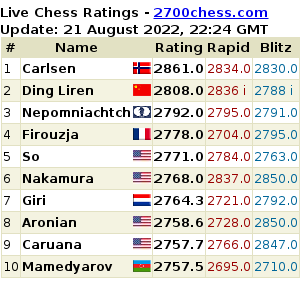 Look at GM So, he is now a supergrandmaster and one of the top 10 GMs in the world w\ an ELO rating of 2771. He could not have attained that status if he stayed here in the Phil. Though I’m based in the US, I’m still a Pinoy and will be a Pinoy(with a Philippine passport fyi)!! Doing my best in training and preparation for the upcoming Olympiad. Good to hear that Ino. Truly, we Filipino chess fans appreciate that. Good luck on the Chess Olympiad!